Preheat oven to 400ºF. Line two baking sheets with parchment paper. zest and vanilla and beat until well combined. Set aside. In a medium saucepan, warm the jam just until it has thinned slightly. Combine jam and blueberries in a medium bowl, stir until thoroughly coated. Set aside. Lightly flour a work surface. Roll out each sheet of puff pastry into a 10-inch square. Cut each square into four small squares. Cut each small square in half diagonally to form 16 total triangles. Place triangles on baking sheets. Prick the middle of each triangle several times with a fork. In a small bowl, whisk egg with 1 Tbsp water. Brush each triangle thoroughly with egg wash. Spread a portion of cream cheese mixture in the center of each triangle, leaving a 1/4-inch border around edges. Top the cream cheese with a portion of the blueberry mixture, spreading it evenly. 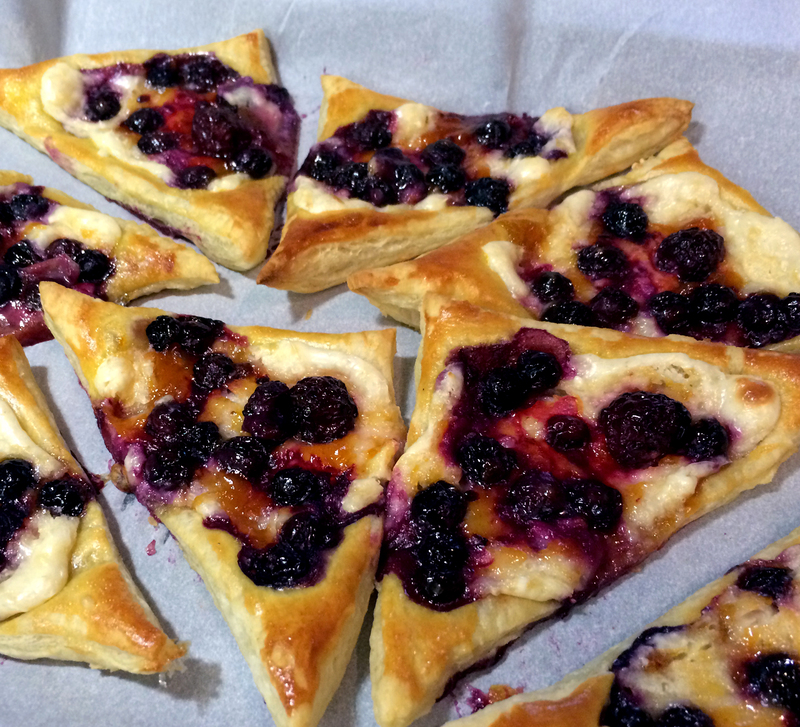 Bake the pastries for 15 to 18 minutes, or until golden brown and puffed around the edges. Transfer the pastries to a cooling rack. Make the glaze: In a medium bowl, whisk together the powdered sugar, milk and lemon juice until combined. Once the pastries have cooled completely, use a small spoon or fork to drizzle the glaze over the pastries. Serve immediately.